Consumers and business have a symbiotic relationship. One can't exist without the other. One can't do well unless the other does well. There continues to be a bias among some that there is a separate entity in the world comprised of business and the stock market, and they bestow money on the consumer. This is a perilous position. It's like saying you don't need air to breath. 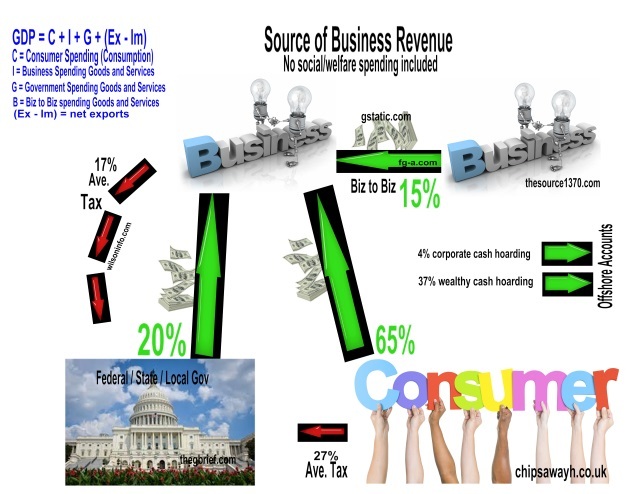 You can also see in the tax routes, if you take consumers out of the picture, the government has no money to spend, and business has to money to buy products from other businesses. Consumer spending rose 3% in 2015, which was good, and helped increase wages slightly, as did the minimum wage. Government spending has remained relatively stable. Consumer spending should have driven GDP to over 2%, not 1%. What happened? It also doesn't help that the wealthy are also hoarding cash. But what would they spend it on? The very wealthy plug 37% of their annual income into offshore bank accounts, bonds, etc. Why do they put their money overseas? "Litigation risk is the old reason. ...the U.S. courts don't have jurisdiction overseas...."
Does it hurt the US economy when people and businesses hoard cash? For business hoarding, yes it hurts, if business can find additional markets so investment can increase jobs and wages. That helps the economy. No, if business can't find additional markets. Using the cash to raise wages, would help, but good luck with getting that to happen. For the wealthy hoarding, yes, if the wealthy spend in the US so it creates business that creates jobs and improves wages, or if the money is put into US banks so that it can be loaned for business startups and other things, so that it has up to a 10x multiplier effect in the economy. Overall what is happening, in my opinion, is markets are not expanding, and businesses have not yet learned how to cope with that, except to raise prices. When business doesn't expand, stockholders are disappointed, which is a bad thing. Businesses began to worry in the last quarter of 2015 when they ran out of gimmicks to inflate stock prices, and saw that markets were not going to make huge gains. While the Federal Reserve continues to think there is no inflation because gasoline prices have gone down, what the average consumer sees is continually rising food prices, restaurant prices, pharmaceutical prices, and other things that they have to purchase day to day. The devil is in the details. The average age of an automobile is now 15 years. Twenty years ago, you couldn't find a car that would last much more than 10 years. Housing prices, which people don't see day to day unless they change residences, are also on a strong upward trend, especially for rentals. While some things in the economy have begun to function since the recession, we continue to have a clash between what business and investors do, and the consumer household. Consumer spending in January 2016 was the same as January 2015, while discretionary income rose .3% a month (3.5% annual). Neither companies nor consumers are spending. It's a standoff.